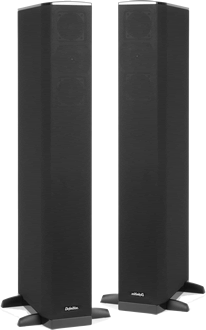 Each BP Series speaker incorporates two complete sets of drivers-one facing forward and the other facing to the rear. Definitive's Bipolar models radiate the full sonic spectrum both forward and rearward in an omni-directional pattern much like sound is produced in real life. The dramatic benefits of Bipolar speakers include a huge three dimensional soundstage for every listener in the room. You don't have to sit in a confined "sweet spot" to enjoy life-like sound quality. Definitive's bipolar speakers literally bring your music and movies to life! Each Definitive BP-8080ST features a D'Appolito front array consisting of two cast-basket 5-1/4" second generation BDSS midrange drivers surrounding a 1" pure aluminum dome tweeter housed in an acoustically isolated sealed enclosure, Linkwitz-Riley crossover networks do a superlative job of seamlessly blending the drivers for totally homogeneous sonic output as if radiating from a full-range pulsating sphere. 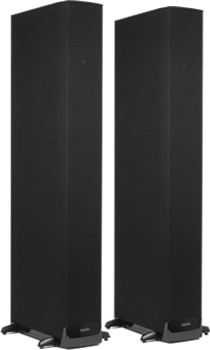 A new patent pending Linear Response Waveguide smoothes off-axis frequency response and disperses sound over a wider area for crystal clear intelligibility for every listener in the room. Each BP-8080ST combines a built-in 12" SuperCube subwoofer driven by a 455-Watt Class D amplifier and two pressure-coupled 12-1/2" Low Bass radiators for 33% more surface area than a single 18" woofer but with better control, speed and detail than a single big woofer could ever deliver. The dual built-in powered subwoofers achieved dramatically better blending, integration and timbre accuracy than could ever be achieved with separate subs. This extraordinary speaker sets a new reference standard for high-accuracy loudspeakers in its class and achieves equally superb performance with both music and movies. The Definitive BP-8080ST reproduces a silky smooth, incredibly detailed sonic image at lifelike volume levels with a sense of ease which is truly remarkable. Definitive's BP-8060ST Bipolar SuperTower! Its combination of Forward Focused Bipolar Array technology, for rich life-like, room-filling, three-dimensional sound, and with a built-in SuperCube powered subwoofer delivers bone rattling deep, but accurate, bass response. The BP-8060 combines a built in a built-in 10" subwoofer driven by a 300-Watt class D amplifier and two pressure-coupled 10" Low Bass radiators for 29% more surface area than a single 15" woofer but with better control, speed and detail than a single big woofer could ever deliver. Each BP-8060ST loudspeaker features a D'Appolito front array consisting of two cast-basket 4-1/2" second generation BDSS midrange drivers surrounding a 1" pure aluminum dome tweeter housed in an acoustically isolated sealed enclosure. This provides a homogeneous sonic output as if radiating from a full-range pulsating sphere. This extraordinary speaker sets a new reference standard for ultra-dynamic high-accuracy loudspeakers in its class and achieves equally superb performance with both music and movies. Many experts and in-the-know listeners agree that bipolar speakers are superior for both music and home theater. With bipolar speaker technology each speaker incorporates two sets of drivers, one facing forward and the other facing to the rear so that the speakers radiate sound both forward and rearward exactly as sound is produced in real life. Forward Focused Bipolar Array technology is Definitive's patent-pending improvement to their original bipolar designs. This new ground-breaking technology combines the huge life-like imaging benefits of bipolar design with improved pinpoint localization. Each Definitive BP-8040 loudspeaker combines a built-in 8" SuperCube subwoofer driven by a 300-Watt class D amplifier and two pressure-coupled 8" Low Bass radiators for over 30% more surface area than a single 12" woofer but with better control, speed and detail than a single big woofer could ever deliver. The built-in powered subwoofers achieve dramatically better blending, integration and timbre accuracy than could ever be achieved with separate subs. The BP-8040ST features a D'Appolito front array consisting of two cast-basket 3-1/2" second generation BDSS midrange drivers surrounding a 1" pure aluminum dome tweeter housed in an acoustically isolated sealed enclosure. The Definitive BP-8040ST reproduces a silky smooth, incredibly detailed sonic image at lifelike volume levels with a sense of ease which is truly extraordinary! 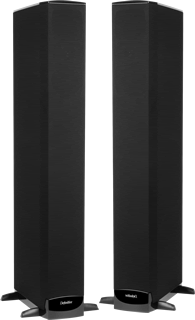 The new Definitive BP-8020ST SuperTower is the result of over 20 years of research and development to create the perfect balance of style, convenience, and most of all performance in a floor-standing loudspeaker. Bipolar technology creates a huge, three-dimensional soundstage for every listener in the room. Movies and music are reproduced with unequaled purity, transparency and lifelike realism. 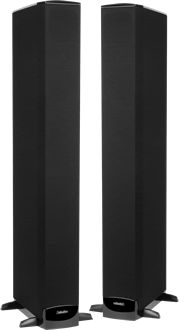 These elegant, slender towers seem to disappear in a huge natural soundstage which extends in a three-dimensional arc beyond the speakers with front to back depth which recreates the illusion of live music or cinematic action being performed live in your room. Each of the new Definitive BP-8020 loudspeakers features a D'Appolito front array consisting of two 3-1/2" midrange drivers surrounding a 1" annealed Pure Aluminum dome tweeter housed in an acoustically isolated sealed enclosure. Each BP-8020ST combines a built-in long excursion 8" subwoofer driven by a 150-Watt Class D amplifier and vented via a critically tuned, wide cross sectional area slot bass vent. The slot shape and wide mouth area of the vent minimize air turbulence for cleaner, deeper, and more efficient bass that will rock your world! Definitive's bipolar speakers make the walls of your room seem to disappear transporting you into the sound space of the recoded event. They will literally bring your music and movies to life in your home. One listen and you can never go back to conventional speakers again! The BPVX is built to the same high construction and performance standards as Definitive's main left and right front speakers and include features like high-definition bass/midrange drivers with butyl rubber surrounds, wide-dispersion pure aluminum dome tweeters with magnetic cooling fluid, complex Linkwitz-Riley crossover networks and solid monocoque cabinets with diffraction-less grille/baffle interfaces. It can be mounted to a wall with the supplied plate or placed on a shelf or stand for the ultimate in surround sound realism. Definitive's bipolar surrounds are designed for easy and unobtrusive placement in your room. Easy-to-use mounting plates are included for wall mounting. 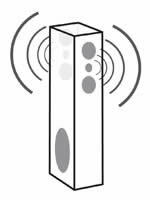 Positioning is non-critical; unlike dipolar surrounds, which are limited by their specific sidewall placement requirements. The BP2X features two 5-1/4 inch high-definition cast-basket bass/midrange drivers for significant performance advantages in the areas of bass reproduction, lifelike midrange clarity and dynamic range. These sophisticated drivers are engineering marvels which incorporate deeply drawn mineral-filled polymer cones, combined with butyl rubber dust caps and surrounds, high temperature vented voice coils and massive magnet structures. This combination of features assures high definition, superb transient response, high efficiency, high power handling and extended linear response. In addition, the aerodynamically designed, non-resonant, cast-magnesium baskets minimize reflections of the sound radiating from the back of the cones and preserve structural and magnetic integrity. Definitive Technology's BP6 is a revolutionary audiophile-engineered, designer-styled loudspeaker intended for musical reproduction and home theater systems of the highest quality. This full-range bipolar (front and rear) radiating system combines the lush spacious soundstaging, lifelike depth-of-field, razor-sharp resolution and pinpoint imaging of the finest dipolar panel loudspeakers with the extended bass response, high-efficiency, wide dynamic range and easy-to-position convenience of the best conventional box systems. BP6's are engineered to be easy to position (just 4" to 24" out from the wall) in any listening room or home theater installation in order to achieve superb sonic reproduction throughout your room. In addition, a major benefit of the special driver topology is wide dispersion, which assures a superb panorama of lifelike sound for every listener in the room. The BP8 utilizes two high definition cast basket bass/midrange drivers (the same as used in Definitive's flagship BP7000 Series) for significant performance advantages in the areas of bass reproduction, lifelike midrange clarity and dynamic range. These sophisticated bass/midrange drivers incorporate deeply drawn mineral-filled polymer cones, combined with butyl rubber surrounds and dustcaps, high temperature vented voice coils and massive magnet structures. This combination of features assures high definition, superb transient response, high efficiency, high power handling and extended bass response. Definitive Technology's BP8 is a revolutionary audiophile-engineered, designer-styled loudspeaker intended for musical reproduction and home theater systems of the highest quality.